Maratheftiko or Vamvakada: Red variety found in the whole area of Cyprus and mainly in the mountains of Paphos, the Kyperounta and Pitsilia. On the last two areas there is the name Vamvakada, although the variety is identical. The Maratheftiko was recorded for the first time in 1893 by the Mouillefert with the name “Marathofiko”. Considered a variety of superior quality which offers a very concentrated wine, deeply colored and full-bodied with a distinct, slightly fruity aroma of cherry and blackberry. However, the spread is more difficult in comparison with Black, since on the one hand, is very sensitive to mold and on the other hand, is characterized by a great fall flower which makes it difficult for the production. The Maratheftiko is covered by a white fluff at the top of the shoots. The young leaves are coarsely chopped, with green-brown colour while older leaves are dark green, with red veins at the ends. The bunch of Maratheftikou is medium size, compact, with usually small, shiny, black grapes which are juicy and ripe at the beginning of September. 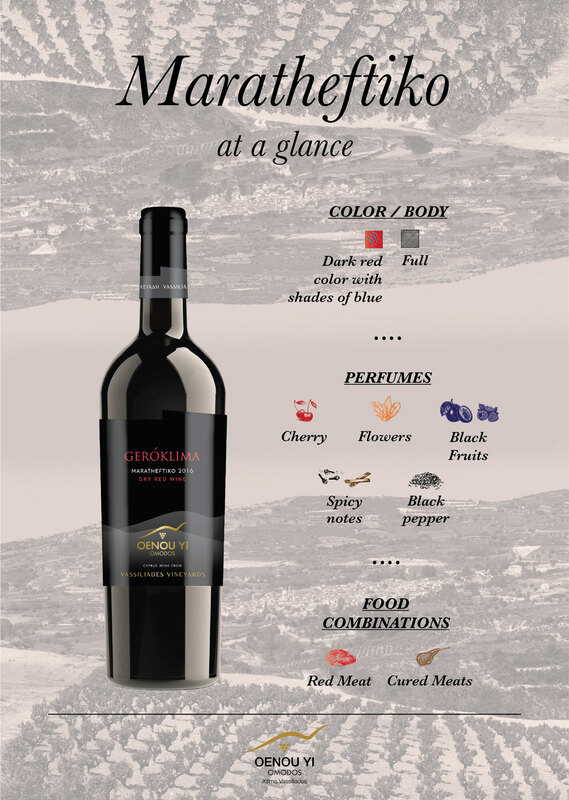 Paying homage to the heritage and tradition of our homeland, “Oenou Yi- Vassiliades Vineyards” has produced a dynamic red wine, “Geroklima” (meaning old, strong vine) from mature vines. This exceptional wine, produced from the indigenous variety “Maratheftiko”, is able to impress even the most demanding of palates. Produce of our privately owned and entirely controlled vineyards, this demanding variety was cultivated and today it fully expresses the identity of the land that hosts it. The best of our grapes were carefully selected and were led to fermentation until dryness. The “Geroklima” 2016 unique character is completed by its maturation in new, oak barrels. After several months of aging under continuous care, its tannins became round and soft, while its fruity flavors were balanced by the sweet notes given by the oak along with the contact with oxygen. It has crimson color with youngish blue shades. The nose presents a bouquet of strong aromas reminding of black fruits and cherry in combination with spicy notes of black pepper and flowers. Balanced mouth and strong body with soft tannins offers long aftertaste without losing any of its flavors. It can be combined in harmony with red meat and traditional cured meats. Ιt is recommended to be served at a temperature range of 15-18ºC even better after a further ageing in the bottle.